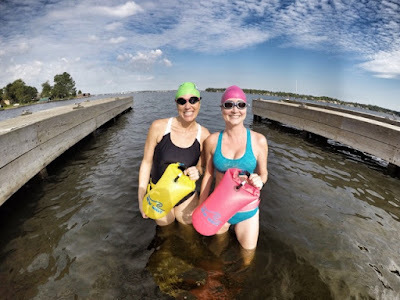 The New Wave Swim Buoy is a safety float and also has a drybag for storing your keys, phone, etc. if you don't want to leave them on the shore. It comes in two sizes - 15 liter and 20 liter. It comes in orange, pink, yellow, and neon green. The swim buoy is highly visible making it a must have for swimmers, triathletes, kayakers, and snorklers. It is easily inflatable. You simply twist open the top, blow it up, and twist the top to close. I am asthmatic and cannot blow up a balloon, but this was a piece of cake. You buckle the device around your waist. The instructions are very simple and easy to follow. Keep in mind this is a security device not a safety device. I have the 15 liter in pink and in yellow. You can purchase a device at www.newwaveswimbuoy.com or on www.amazon.com/shops/NewWaveGear. I would say the biggest selling point to me is the visibility factor. 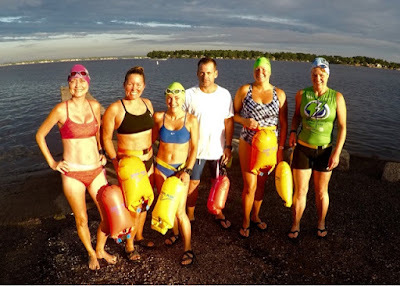 Many members of Strike Force Racing team use the New Wave Swim Buoy. 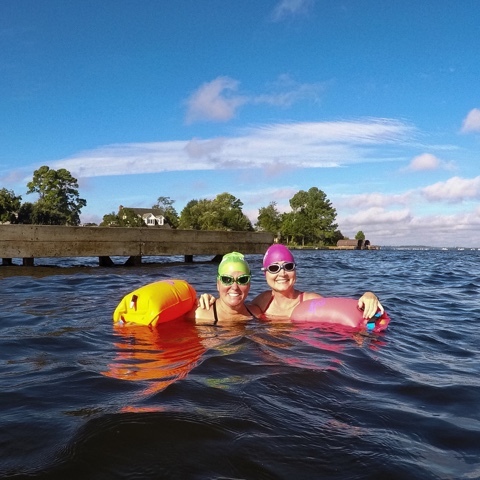 When we are out in an open water swim we can easily spot each other. This is helpful for keeping an eye out for each other and also for sighting purposes. It's much easier to stay on course following the bright buoy in front of you. But more importantly we are visible to the boaters in the area. From the shore I personally witnessed a boat go around my teammates. I hate to think what could have happened if they didn't have the buoys and were unable to be seen. And it was great that even from the shore we could still spot our teammates at a good distance. USAT and Ironman Certified Coach Gena Alvarez of Strike Force Racing always trains along side her athletes. She loves her New Wave Swim Buoy! I was concerned there would be drag in the water or pulling at the waist using this device. I didn't feel a thing. In fact I would completely forget it was there. 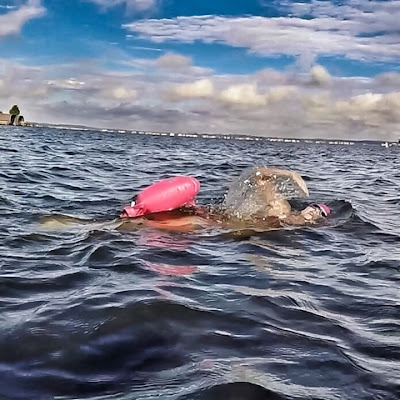 It was great too because my coach stops at the buoys occasionally to give instructions or feedback and you have the buoy to rest on if you need. 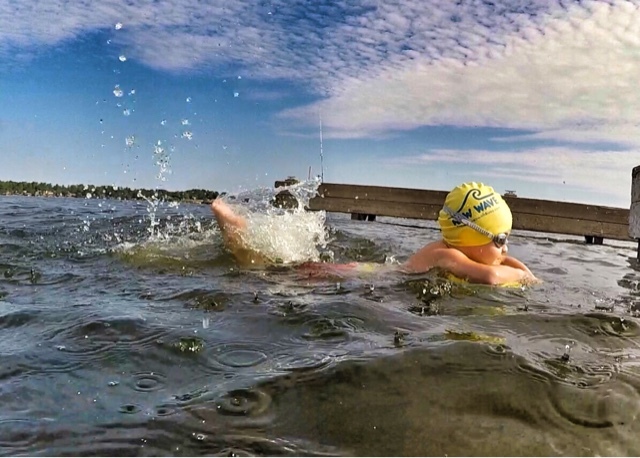 Another big plus for the swim buoy is the confidence it gives you out in the open water. 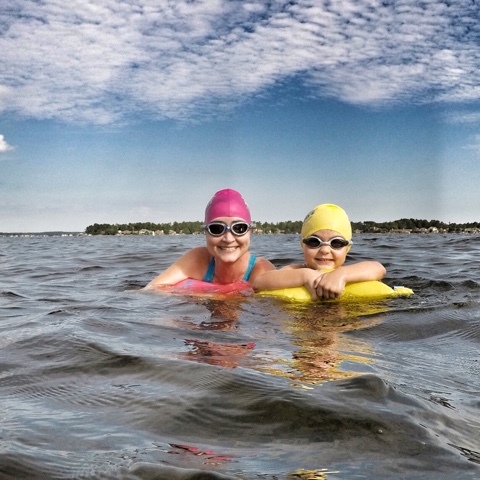 My teammate Sam is trying to face her fear of open water. 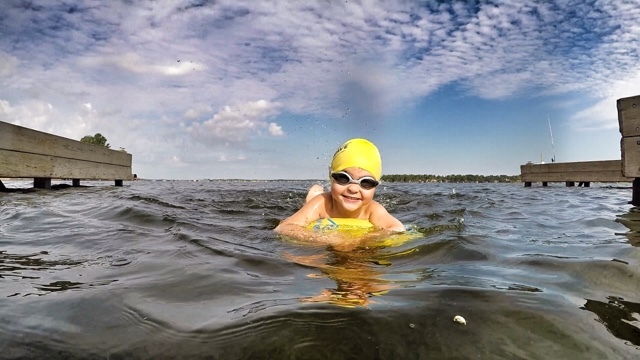 Many of us start off timid or downright fearful out in the open water. Some overcome this fear and some continue to struggle to face it. I gave her a buoy to try out and it gave her the confidence she needed to get out there. She was sold and is getting one of her own! And yet another bonus is the security it offers your kiddos as well. Emerson is not yet 5 years old. He could swim with it attached no problem. And he could use it to rest or kick back when he needed. This little guy just might be my ticket to Kona someday!! This looks like an amazing product! If Emerson can use it, anyone can! Though, he's an amazing athlete at 4!!! Love all your OWS pics!! !